We’d love your help. Let us know what’s wrong with this preview of The 17 Indisputable Laws of Teamwork by John C. Maxwell. Building and maintaining a successful team is no simpletask. Even people who have taken their teams to the highest level in theirfield have difficulty recreating what accounted for their successes. Is it astrong work ethic? Is it “chemistry”? What tools can you wrap your hands aroundto build–or rebuild–your team? In The 17 Indisputable Laws of Teamwork, leadership expertand Building and maintaining a successful team is no simpletask. Even people who have taken their teams to the highest level in theirfield have difficulty recreating what accounted for their successes. Is it astrong work ethic? Is it “chemistry”? What tools can you wrap your hands aroundto build–or rebuild–your team? 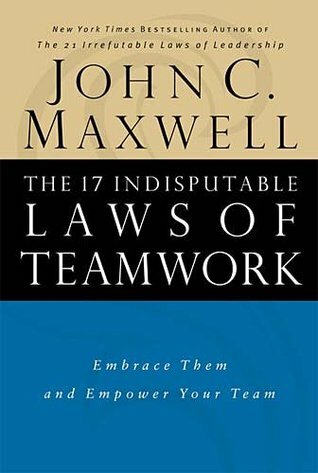 In The 17 Indisputable Laws of Teamwork, leadership expertand New York Times bestselling author John C. Maxwell shares the vitalprinciples of team building that are necessary for success in your business,family, church, or organization. In his practical, down-to-earth style, Dr.Maxwell shows how: The Law of HighMorale inspired a 50 year-old man who couldn’t even swim to train for thetoughest triathlon in the world. The Lawof the Big Picture prompted a former U.S. president to travel crosscountry bybus, sleep in a basement, and do manual labor. Playing by The Law of theScoreboard enabled one Web-based company to keep growing and making money whilethousands of other Internet businesses failed. Ignoring The Law of the PriceTag caused one of the world’s largest retailers to close its doors after 128years in business. The 17 Indisputable Laws of Teamwork will empoweryou–whether coach or player, teacher or student, CEO or non-profitvolunteer–with the “how-tos” and attitudes for building a successful team. To ask other readers questions about The 17 Indisputable Laws of Teamwork, please sign up. I am about 1/2 way through it and thus far it is feeling very light. It is full of examples of other teams but missing meaningful concrete exercises to become a better team member. That is, the book concentrates on mantras like, "To be a better team member you need to sacrifice more." Here are examples of sacrifice. This is not helpful. It is equivalent to saying to someone "You need to save more money to get out of debt." But not identifying how to go about that. I will update the review when I I am about 1/2 way through it and thus far it is feeling very light. It is full of examples of other teams but missing meaningful concrete exercises to become a better team member. That is, the book concentrates on mantras like, "To be a better team member you need to sacrifice more." Here are examples of sacrifice. This is not helpful. It is equivalent to saying to someone "You need to save more money to get out of debt." But not identifying how to go about that. I will update the review when I finish the book. I do highly recommend his other book "Developing The Leader Within You"
There is no greater fan of John Maxwell than John Maxwell. He loves to highlight his own successes ad nauseum. His "laws" are highly and easily debatable. I read this as part of reading group at work. To have a discussion on any chapter with a positive result was difficult. We usually ended up discussing how we would have written the chapter. It was difficult to get through. is read this immediately after the laws of leadership. some of the content repeats from the previous book, but stuff is a must read if you're looking to build teams and multiply your influence. Благодаря сервису getabstract.com я познакомился с книгой Джона Максвелла. Книга аж 2001 года, но с того времени мало что изменилось в умении бизнес-авторов размазывать мысль на длинные списки. Отфильтровав саммари книги (а бывает и такое! ), предлагаю 4 простых правила, которые есть и в самом источнике, и в моей голове - стараюсь их использовать в работе. 1. Побеждают команды, а не отдельные личности. Ответственность может быть только общей. 2. Ритм команды зависит от скорости самого медленного. О Благодаря сервису getabstract.com я познакомился с книгой Джона Максвелла. Книга аж 2001 года, но с того времени мало что изменилось в умении бизнес-авторов размазывать мысль на длинные списки. Отфильтровав саммари книги (а бывает и такое! ), предлагаю 4 простых правила, которые есть и в самом источнике, и в моей голове - стараюсь их использовать в работе. 2. Ритм команды зависит от скорости самого медленного. Особое внимание "запасным" и "внешним" (аутсорс) элементам. 3. Команда должна видеть, понимать цель и верить в нее. Планы необходимо корректировать, корректировать цель нельзя. This book is a literal road map to just about anything you want to accomplish in life. From raising a family to Counseling and even building a business. John Maxwell what does a great job detailing the importance of teamwork and how one person is too small number for greatness. Teamwork really does make the dream work. John Maxwell A+ yet again! This book is perfect for anyone who is in an environment where teamwork is essential...which nowadays is pretty much everywhere. After reading, I'd suggest using in conjunction with the video and workbook as a team building/learning situation with your team. He adds humor with the teaching so its not boring at all, promise! LOVE JOHN MAXWELL AS A TEACHER!!! As good as his other book - common sense, but stuff that needs reminding every once in a while. Though some of the examples are a bit dated (for example, any reader of this book ought to get a few chuckles out of the praise that its author, John Maxwell, gives to the crooks who ran Enron for their innovative thinking), this book ought to provide encouragement to a wide variety of readers so long as they are well-versed with business language and are at least moderately fond of sports examples. If you are a fan of Maxwell’s 21 Indisputable Laws of Leadership (which are briefly recapped in t Though some of the examples are a bit dated (for example, any reader of this book ought to get a few chuckles out of the praise that its author, John Maxwell, gives to the crooks who ran Enron for their innovative thinking), this book ought to provide encouragement to a wide variety of readers so long as they are well-versed with business language and are at least moderately fond of sports examples. If you are a fan of Maxwell’s 21 Indisputable Laws of Leadership (which are briefly recapped in this book’s chapter on the Law of the Edge, then you will almost certainly enjoy this book. This book is slightly over 250 pages (and is a pretty quick read), divided into the following seventeen chapters: the Law of Significance, the Law of the Big Picture, the Law of the Niche, the Law of Mount Everest, the Law of the Chain, the Law of the Catalyst, the Law of the Compass, the Law of the Bad Apple, the Law of Countability, the Law of the Price Tag, the Law of the Scoreboard, the Law of the Bench, the Law of Identity, the Law of Communication, the Law of the Edge, the Law of High Morale, and the Law of Dividends. Each of these laws is defined, using business jargon, and then examples are given from the business, sports, or military world. A lot of the laws are interrelated. For example, several of the laws concern the importance of all members of the team (the Law of the Bad Apple, the Law of the Chain, and the Law of the Bench all end up preaching the point that any destructive member of the team will kill results for the whole team, that a team is only as strong as its weakest link, and that a great team has a great bench that allows its reserves to be almost as good as its starters). Another example is that the Law of the Price Tag and the Law of Dividends combine to show that for teams to succeed they have to be willing to pay the price–but that the rewards are far greater than the price. Additionally, the Law of Significance, the Law of the Big Picture, the Law of the Niche, the Law of the Compass, the Law of Identity, and the Law of the Scoreboard show that for teams to succeed they have to know who they are, where they fit, and how they are doing. This additionally requires communication and the ability to count on their teammates (two more laws). I had high hopes for this book. I really wanted some good lessons and principles on teamwork, team-building and team leadership. Instead, I got a bunch of lists of (mostly) common sense items: Your team is only as good as its weakest link, great teammates take it further, great team leaders inspire the team, your team needs a vision, teammates with bad attitudes bring the whole team down, etc., etc. And then for each item on the list, there was another sub-list of truths about that item. Dry read I had high hopes for this book. I really wanted some good lessons and principles on teamwork, team-building and team leadership. Dry read of a long list of pretty common sense items. Not a whole lot of empowering insights. There were a few decent stories. That's about it. Disappointed. This was a very I delightful book that provides many methods to create a better team. I particularly enjoyed how the author provides helpful tips at the end of each chapter for both team members and team leaders. You won't always be a team leader or member and knowing both sides can provide guidance and insight. I look forward to reading more from Mr. Maxwell I. the future. John Maxwell nos brinda este excelente libro para cualquier persona que tiene que trabajar en un equipo o es líder de un equipo, con muchos tips por aplicar en la vida cotidiana. Excelente libro para crecer como líder y hacer crecer nuestro equipo de trabajo. Cada ley nos da nuevos matices que en la práctica no se nos hacen difícil de implementar si le ponemos empeño y dedicación. These laws will help any leader or team member realize what their place is on the team, or to know if they have no place on the team. Because of this book I was able to direct my team better and renew passion to be there. Me parece que el libro es bueno. Me gusta que ejemplifica bastante bien, no me gusta que tiene un enfoque muy deportivo. Recomiendo en libro para líderes en formación o jefaturas que quieran un nuevo impulso o ideas. Interesante lo que dice y cómo lo plantea. This book is amazing. I want to pass it on and share it with everyone! A tad light for my taste and some of the leadership examples were pretty dubious (Enron, really?). But still, there was some good advice here and there. I love how detailed John Maxwell is with his books. Yet another great read. Lots of lessons to implement. Recomendado para compartirlo con tu equipo de trabajo. A great read for teams. Some great principles share to foster collaboration and team development. If your team commits to read and execute, it will transform the way your work with people. This book is simplistic, dated, and seems to have been written simply so the author could name-drop. Good book for managers. Easy read, but thought provoking. Leads to great discussion. I read the book in Arabic and it was amazing. The book is wonderful and full of useful information and stories. Big name dropper this guy. Fast read with some good key takeaways. Really easy to follow. Too many sports analogies for me, and a little too male-dominate. Lois of great information. Succinct. I need a summary of the list to keep handy and review periodically.